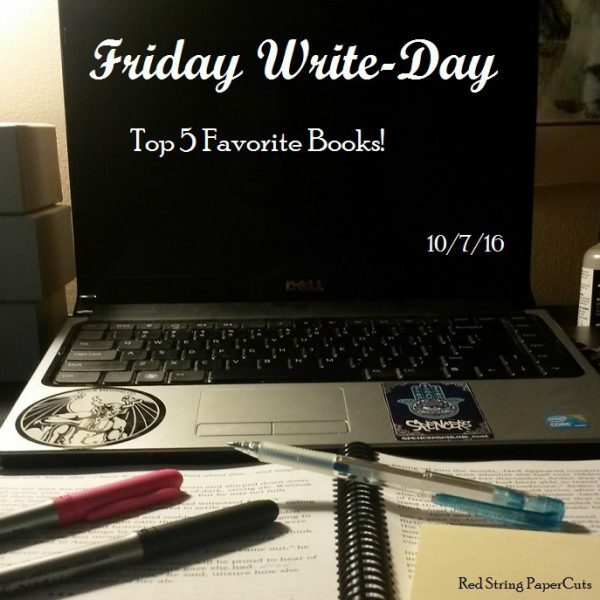 Friday Write-Day: Top 5 Favorite Books! Fantasy/Sc-fi/Adventure – Do I need to explain this one? My brain is a web of day-dreams, fake scenarios, and fantasies. How could I not love books that allow me to live in completely insane and scary worlds?! History: Wait, don’t leave! History is storytelling too, just in an often long-winded and argumentative way. This broad concept of the past shaping the future is also the most basic, distilled inspiration for my novel. Social Commentaries/Contemporary Issues: Stuff matters. And I like reading about stuff that matters and feeling like by reading it I make them matter more. Or something. In case you haven’t been paying attention, some of my posts here can stray into the sociopolitical realm. I realize that most people don’t come here to read that stuff (judging by the views), but it’s just part of my daily thought process. For my top 5 favorite books, I could have easily gone all-fantasy/sci-fi, but that’s boring and not reflective of either my interests or my bookshelf. I also could have selected numerous books I’ve read over the last few years and just gone with those. However, that ignores the stories and authors who really helped shape the storyteller I’m aspiring to be today. It’s also recency bias. So here’s the list I came up with! I reserve the right to change this list without warning, apology, or logic of any kind. My Top 5 Favorite Books! In a lot of ways this one is an honorable mention, hence its placement at #5. For those of you who did not have a complete childhood were not fortunate enough to grow up with Jacques’s stories, Redwall is a children’s fantasy series based on the adventures of the mice, hares, otters, badgers, and other cuddly forest creatures of Redwall Abbey, who have to fight to protect their home from rats, foxes, weasels, and other forest predators. But, like, with swords and stuff. I read this book as part of my upper-level studies in history during college. It is an autobiography in which the author, a German woman and journalist, must choose to survive the Soviet siege of Berlin during World War II by “serving” an officer of the Soviet army, who protects her from a likely far more cruel fate and provides her with food and cigarettes otherwise not available to the besieged citizens of Berlin. Brutally honest to the point that it was buried in German society for decades following the war, this brave woman’s story uncovered the harsh realities faced by the victims of war, and how she personally navigated the emotional and physical conundrum of choosing to accept sexual violence as a means of survival. Without putting too fine a point on my “stuff matters” bit, there are always parallels to be drawn from history. I challenge anyone to read this story and not be reminded of the citizens of Aleppo, Syria, the siege of which has resumed in full force with the collapse of the US-Russian truce just last week. Another book from a healthy list of college reads, Journey Into the Whirlwind mines deep into the human soul to study one person’s journey through an unthinkable situation. Without remembering the finer details, Ginzburg was a citizen of Stalin’s Russia who was accused of treason and spent 18 years in the Gulag, and most of that time in solitary confinement. Let me repeat that. Eugenia Ginzburg spent 15 years in a black, cold, damp box with no human contact. And her book takes the reader through every agonizing, tortured minute of her psychological descent towards madness. This book made me question my own existence. Ginzburg has another book entitled Within the Whirlwind which I have not yet read, but at some point I will allow her to cast a shadow over my own sanity once again. I am only through the first five books of this 14-book series, and it has already irreversibly changed my perception of storytelling and character building. The intricacy with which Jordan weaves his own narrative Pattern and the depth to which he develops entirely real and unique voices for his characters is a genius most writers can only aspire to. I’m certainly not the first person to feel this way about this series, as Jordan has already been raised to the pantheon of great writers by many fantasy lovers. But I actually have to pace my reading of these books, otherwise I just wouldn’t read anything else for two years. Read these books. If my natural curiosity and sense of adventure were ignited by Jacques in elementary school, then they were seared into my being when I first read Tolkien’s story of Bilbo Baggins around age 12. Okay, I’m going to cheat and add a some real honorable mentions even though this post is already 800 words too long and no one will scroll down this far. A Song of Ice and Fire, by George R.R. Martin — I’ve talked quite a bit about Martin’s books, but his character building is masterful. Detroit City is the Place to Be, by Mark Binelli — A tragic and yet inspiring look into what the post-industrial world looks like after it collapses by a journalist who returns to his hometown after 20 years away. I’m definitely going to spotlight this one in the future. Hope you enjoyed, and thanks for reading this far! What books would you include in a top 5 list? I’ll add Red Wall to my TBR (metaphorically). The way I read these days is limited to what I can jump into between Sanderson novels and those my friends and fellow authors have written. But in those rare times I look around and notice I don’t have something to read I should have read months ago, I have a stack of “books I’ll read before I die (barring accident and act of God).” It’s not quite that dramatic, but I like to have a healthy stock of books for those times I don’t have a healthy stack of books. (I promise that makes sense). If it’s something that stuck with you THIS long, it deserves a shot. My childhood reading was The Boxcar Children. Loved it growing up. My stock of books tends to be old faithfuls that I’ll fall back on just for enjoyment’s sake, such as Tolkien and now Martin. I’ll admit, I haven’t actually read any of Jacques’s stories in quite a long time, but after putting so much thought into them recently I’m going to have to dust them off and read a couple. I don’t believe I’ve read any of The Boxcar Children, but they sound really interesting.